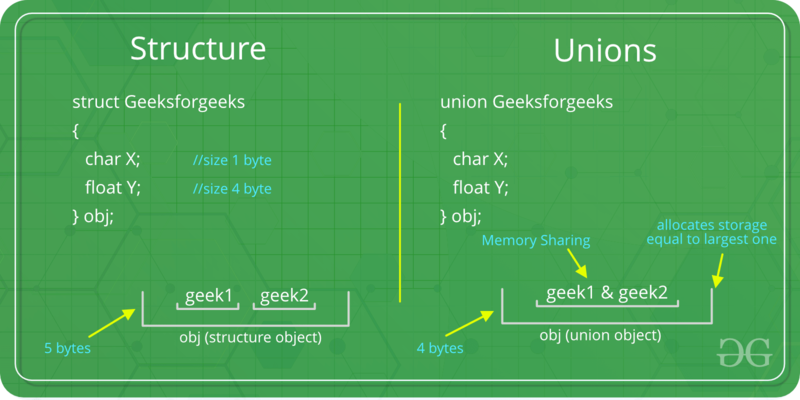 Like Structures, union is a user defined data type. In union, all members share the same memory location. For example in the following C program, both x and y share the same location. If we change x, we can see the changes being reflected in y. How is the size of union decided by compiler? Size of a union is taken according the size of largest member in union. printf("sizeof(test1) = %lu, sizeof(test2) = %lu, "
Like structures, we can have pointers to unions and can access members using the arrow operator (->). The following example demonstrates the same. What are applications of union? then every node requires 16 bytes, with half the bytes wasted for each type of node. On the other hand, if we declare a node as following, then we can save space. The above example is taken from Computer Systems : A Programmer’s Perspective (English) 2nd Edition book.